TodaysWoundClinic.com: Medicare Reimbursement of NPWT Pumps in the U.S.
TodaysWoundClinic.com: Similar to surgical dressings, there was first just one negative pressure wound therapy (NPWT) pump. The manufacturer of that device had the difficult job of introducing NPWT to Medicare; obtaining HCPCS codes for the product, canister, and dressings; obtaining a reasonable DMEPOS Fee Schedule allowable payment rate; obtaining a CPT code to account for the QHPs work of applying the device; working with the DME MACs to write the first LCD for NPWT; and working with the MACs to include positive coverage for the application of NPWT in their LCDs. 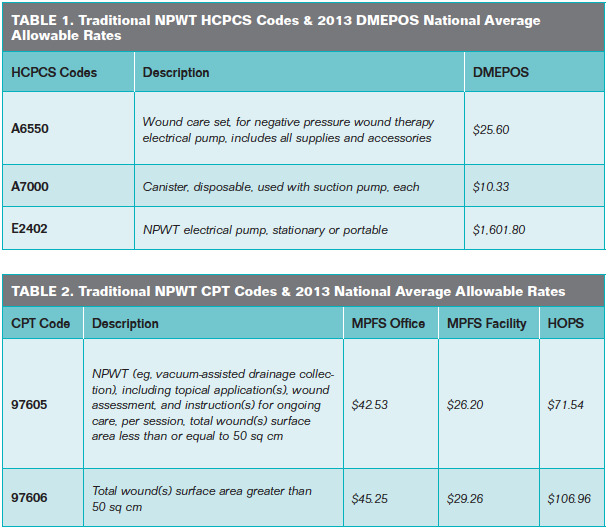 See Table 1 for a list of HCPCS codes created for traditional NPWT pumps/supplies/dressings and the 2013 national average DMEPOS Fee Schedule rates for those codes. These codes and allowable rates apply when a patient obtains the equipment from a DMEPOS provider/supplier and uses the equipment in his/her home. If a home health agency (HHA) is providing care to the patient in the home, the HHA is not required to supply the traditional NPWT pump/supplies/dressings. The Medicare Part B-covered patient should acquire the NPWT equipment/supplies/dressings from a DMEPOS provider/supplier. Similar to the “explosion” of surgical dressings on the market after HCPCS codes and DMEPOS Fee Schedule allowable rates became available, numerous brands of NPWT pumps/supplies/dressings with the same/different features are now available in the marketplace. Those interested in ordering a new brand of NPWT pump can find a listing of traditional NPWT pumps/supplies/dressings that CMS verified eligible to use the traditional NPWT HCPCS codes at www.dmepdac.com/dmecsapp/do/search.